It's easy to get way too esoteric when we're talking about how important it is for an organization to understand its data. Yes, trustworthy data is critical for our customers to meet needs like serving customers, managing risk, predicting costs, and analyzing markets. MIOsoft software is saving lives through better data. We're very proud that we can say that now too, as MIOsoft is the data quality solution for a new state program in Wisconsin that's built to save lives. 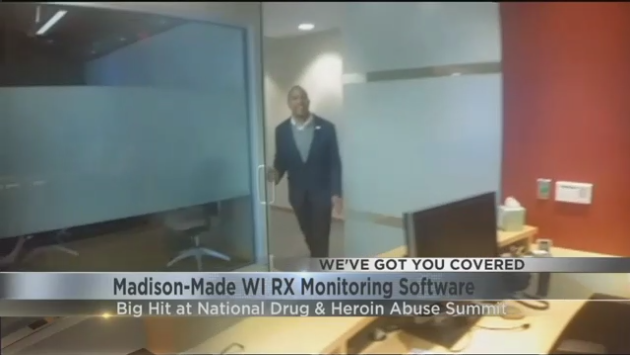 Wisconsin's enhanced Prescription Drug Monitoring Program (ePDMP) utilizes our software, and was recently featured at the 6th annual National Rx Drug Abuse & Heroin Summit in Atlanta, GA.
We’re very excited to share the news from our latest press release! 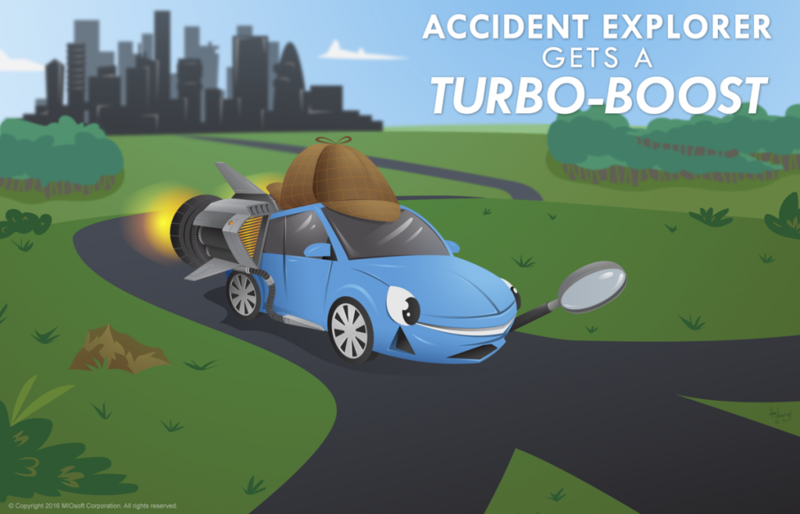 Labor Day is coming up, and here at MIOsoft, we have Accident Explorer on the brain again. If we’re not driving for the holiday weekend ourselves, we know someone who is. 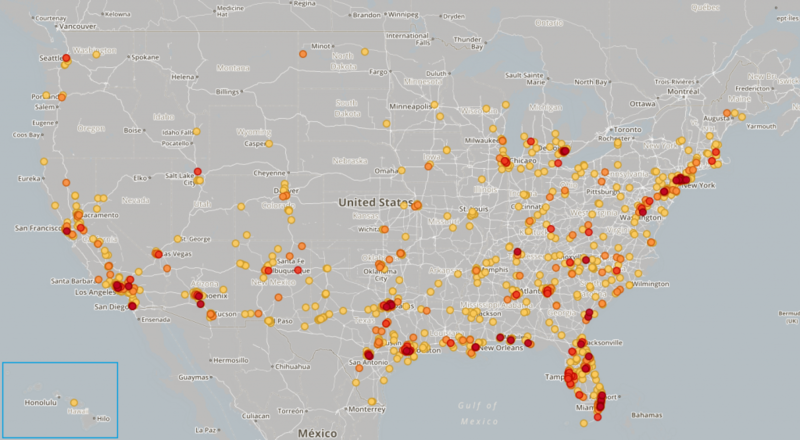 In our last post, we looked at 15 potentially-significant clusters of fatal vehicle accidents throughout the US, using all of the NHTSA’s Fatality Analysis Reporting System data from 2008-2014. We tried to distribute our picks throughout the country... but with only 15 picks over 3.8 million square miles, there were huge areas of the US where we didn’t identify a (relatively) nearby 2008-2014 cluster. For a topic as hot as Customer 360 is, it’s strange that the web is so devoid of helpful information. Sure, plenty of vendors have documents that claim they can deliver it. 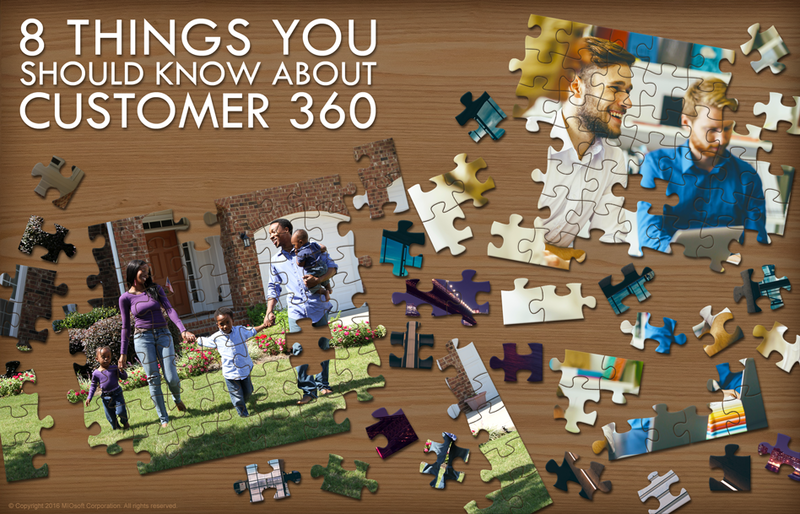 But apparently few are willing to provide information that helps you wrap your head around exactly what Customer 360 is and how to make it happen. We’ve been focused on the research, development, and delivery of the technologies required for a complete, 360-degree-view of customers for a long time now. So I’d like to use our experience to start filling that void, and share a few of the most important things you need to understand about Customer 360 if you’re considering starting—or are currently struggling with—a Customer 360 project. After Accident Explorer's latest update, we started displaying accident clusters based on three-year intervals—but we were still curious about what clusters created using all the data, 2008-2014, would look like, and we thought you would be too. So we fired up a copy of Accident Explorer, removed the three-year restriction for clusters, eliminated all the clusters with fewer than 5 accidents, and started poking around. 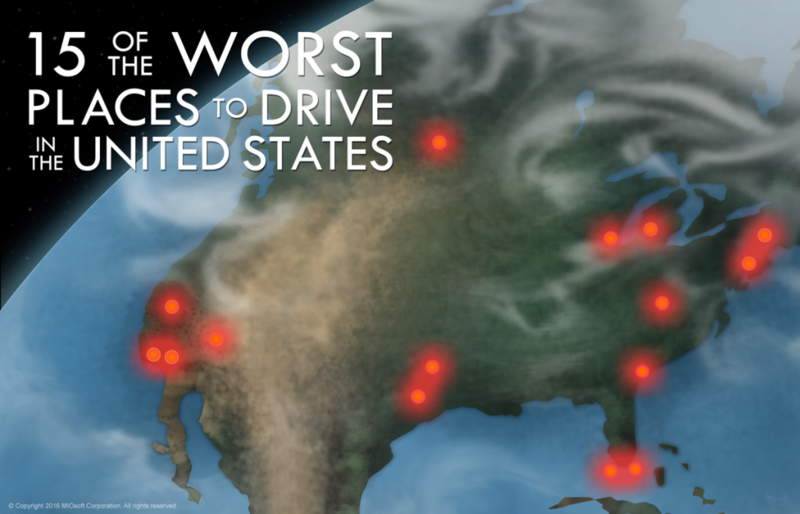 Here are our picks for 15 of the worst places to drive in the United States. We love our cars in America. So much that over 87 percent of the driving-age population in the United States has driver's licenses. So if you ever drive a car—and odds say you do—you should check out our newly-upgraded Accident Explorer project, which we first wrote about just over a year ago. It now includes the latest dataset from the National Highway Transportation Safety Board, which is for the year 2014. We’ve also given the interface a makeover and rethought how we display the data. Now, instead of clustering data from all the years together, we cluster data over three-year intervals. As you pick different intervals, you can see how the clusters change—or don’t—over time. Customer 360, Single Pane of Glass--whatever you want to call it, it promises to integrate all of your data into a single, unified display. Everyone wants it, and with good reason. Here’s what no one’s willing to admit: Customer 360 is easy when you have a single system full of pure, harmonious, complete data, but very few businesses have that. And getting Customer 360 out of messy, conflicting, fragmented systems is a lot harder. But here’s something else: that’s okay. 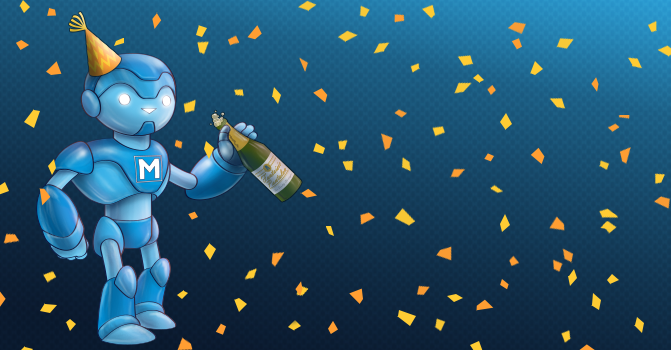 We’ve made our second appearance in the Gartner Critical Capabilities for Data Quality Tools and Gartner Magic Quadrant for Data Quality Tools reports! 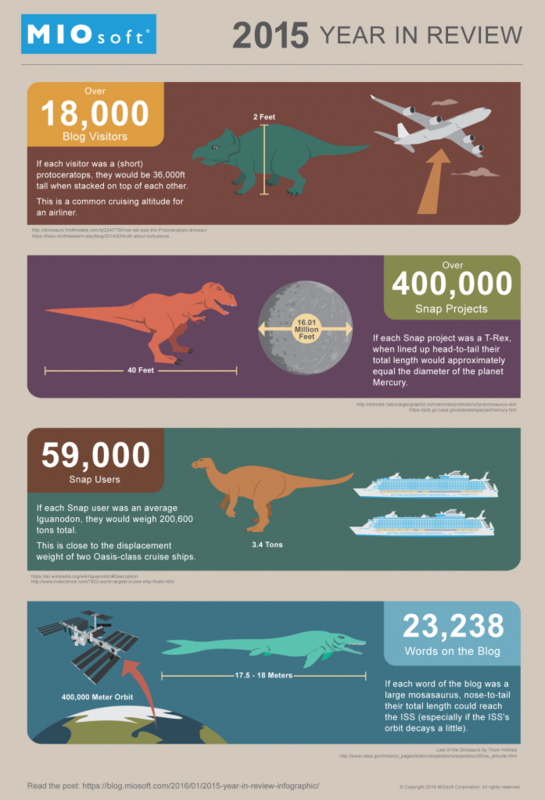 And just like you should never trust a dashboard, you should never trust an infographic—we rounded our visitor, user, and project counts to the nearest thousand. 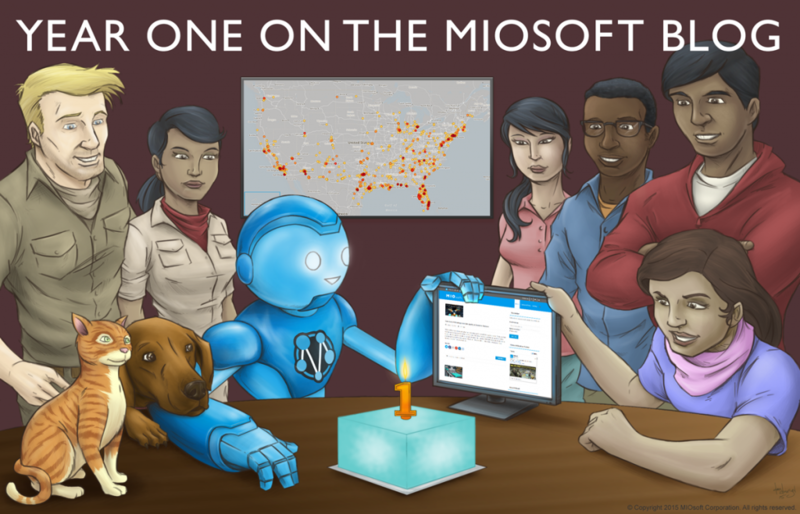 Today is the first anniversary of the MIOsoft blog: the first post was on December 5, 2014. While we're looking back over the past year as we celebrate this milestone in the life of the blog, we're also looking forward to another year of sharing our thoughts with you here. Over the past week, we've been featuring some of our favorite posts from the past year on social media, with introductory comments from the post authors. If you missed any of it, you can catch up below. We’ve written in previous posts about our technology and its benefits in a general sense. 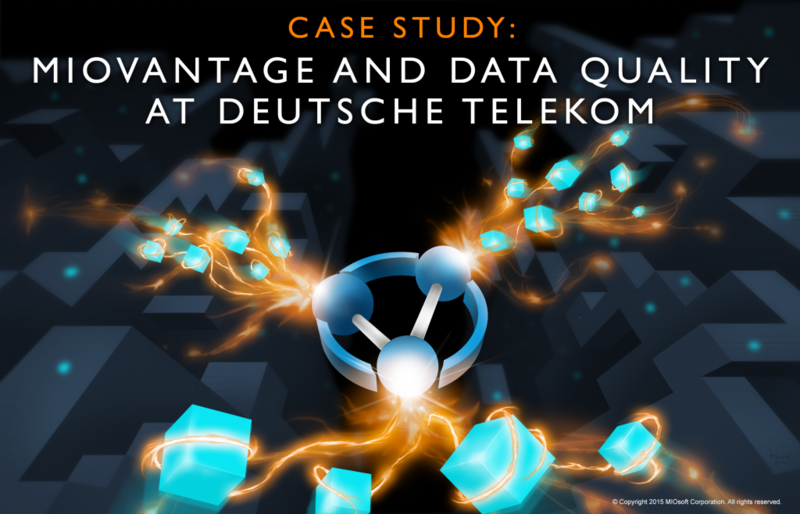 Today we’d like to share some more concrete details, with a case study about how we used MIOvantage for complex, large-scale data quality analysis at Deutsche Telekom. One day, we got a call from one of our clients: they had a deadline to submit data to another organization, and they’d spent months struggling to meet the requirements. With the deadline imminent, they’d made no headway. Could we help? We set up a meeting to discuss their issue with them. Little did we know that this experience was going to be a perfect illustration of how data tools make assumptions about the nature of the data you’re working with… and how those assumptions aren’t always accurate. The root of our client’s problem was that they couldn’t make horizontally repeating data into vertically repeating data. 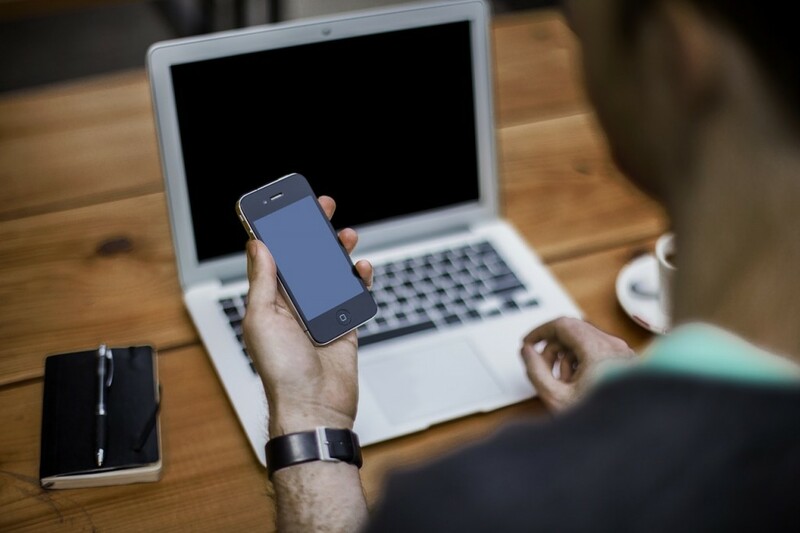 The Internet of Things has been defined in many different ways, and it’s been labeled a marketing buzzword probably just as often as it’s been hailed as revolutionary. But I believe the Internet of Things can be revolutionary. 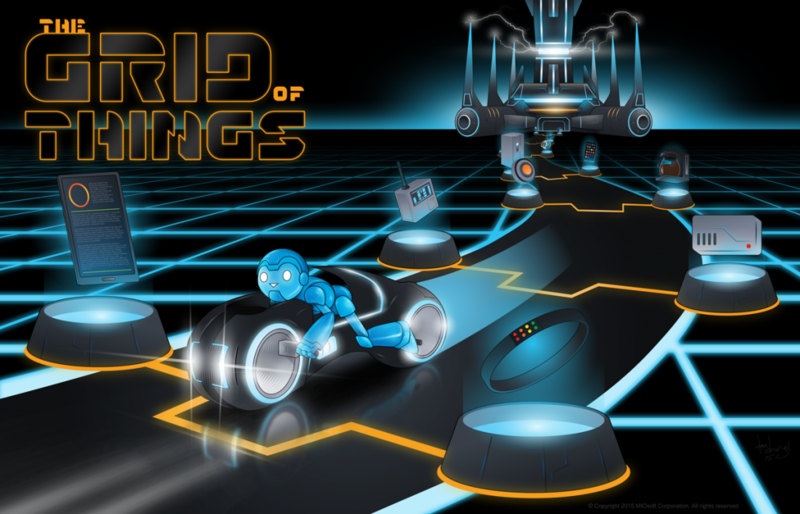 That sentiment is mostly inspired by similarities between IoT and the Grid. Even if you don’t read anything else in this post, you should at least read the following quote. Then tell me that the original vision for the Grid doesn’t eclipse any vision for IoT that you’ve ever heard. The Yahara watershed is home to 370,000 people and 30,000 cows. It covers 170,000 acres and has 5 major lakes, linked by the Yahara River, and formed 14,000 years ago as the glaciers retreated. Reports from early European settlers praised the clarity of the lakes and their beautiful white sand. 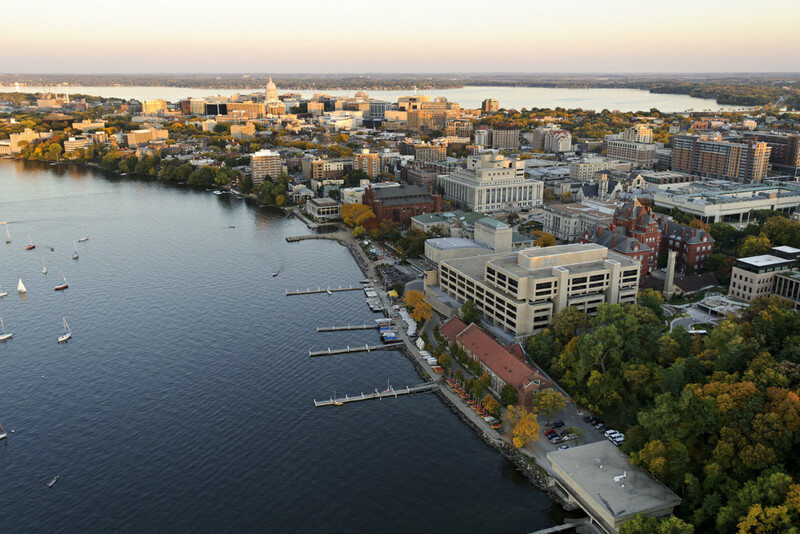 And cradled among the three northernmost lakes—Mendota, Monona, and Wingra—was the infant city of Madison. Let’s talk about MIOsoft’s newest venture, Barrage. Barrage provides insightful real-time analytics and alerting for IoT data. You can also use Barrage to store data for historical examination and analysis—and do real-time analytics at the same time. This week, the Wisconsin Tech Council held the 13th annual Wisconsin Entrepreneurs’ Conference, Nurturing Entrepreneurial Roots, at the Alliant Energy Center. MIOsoft was present not just as a sponsor, but via the participation of our very own Josh Herritz, who was a conference co-chair, a member of the steering committee, and moderator of the panel Using social media to market your startup. There’s a tendency, in conversations about big data and IoT, to only talk about examples from the extreme upper echelons: the biggest corporations with the largest amounts of data from the most sensors. In the excitement, it’s easy to lose sight of the fact that most organizations aren’t multinational megacorps with petabytes of data. Most organizations operate at a much smaller scale: their reach is national or regional. 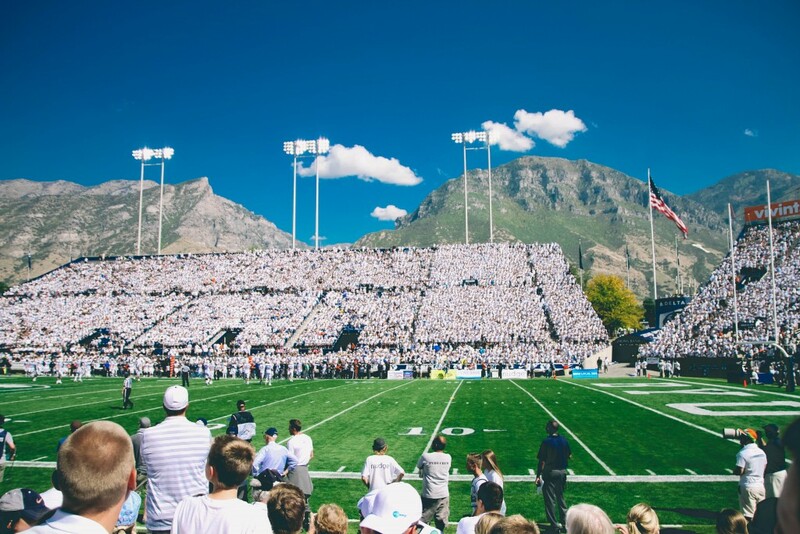 And many of these organizations use big data and the IoT to provide products and services that can actively improve the quality of life in their communities. So even though they’re still growing, they can have effects on individuals that are far more significant than a perfectly-timed personalized coupon. Jordan Barrette and I have been in Chicago this week for the inaugural Microsoft Ignite conference. If I had to pick one word to summarize the experience at Ignite, it would be GIANT. What does giant look like? Monday’s opening keynote was a morning-long mega-show. Being Microsoft means you can have Common kick off your event with a spoken word performance meant to inspire all 23,000 people you’ve collected in one cavernous room. Providing a good view for all those people means casting the stage to a lot of very large screens. Several years ago, MIOsoft experienced one of my favorite customer information management disasters. A major computer hardware vendor mistakenly had an address for an office MIOsoft hadn’t used in over a decade as our ship-to address for an order of servers. Although it was corrected in time, this address subsequently popped up in interactions with the vendor for the next several years. At some point, everyone working with that vendor from MIOsoft had the same question: can the address ever be changed? But it seemed that no matter what we or the vendor did, the address refused to die. Hey, Gartner subscribers: the 2015 Gartner Magic Quadrant for Enterprise Application Platform as a Service, Worldwide was released Tuesday, March 24. You can find MIOsoft positioned in the Visionaries quadrant for enterprise aPaas worldwide*, based on our ability to execute and completeness of vision. One evening I went out to the curling club for a few hours and, according to the electronic sign over the highway, three people died on Wisconsin roads while I was there. There are more than 4 million miles of roads in the United States, and 210 million licensed drivers. That’s a lot of opportunities for things to go wrong. And they do: from 2010 through 2013, there were more than 120,000 fatal vehicle accidents in the US, according to the NHTSA’s Fatality Analysis Reporting System (FARS). There’s probably an intersection, turn, or merge point near you where you’re used to seeing cars sitting in the shoulder with their hazard lights on. But do some stretches of road actually have more fatal accidents than others? And if there are dangerous locations, where are they? We decided to use MIOedge’s machine learning capabilities and the FARS data to find out. 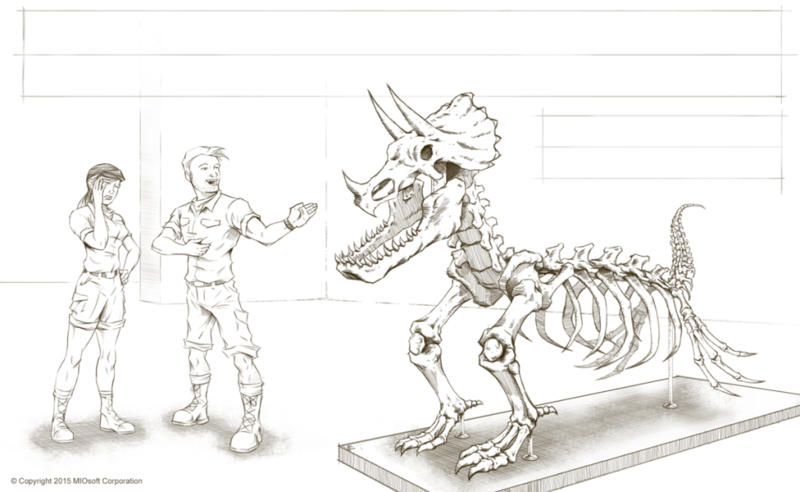 We’re embarking on a new project today: MIOsoft’s first book! Other companies usually focus on working professionals as their target audience, but we’re so confident our technology will come out on top that we decided to go off the beaten path and appeal directly to the next generation. Today’s third-graders are tomorrow’s database administrators, and we want them to be prepared for the context-based technology landscape of 2035. For the many startups in the mix, the opportunity to connect with interested leaders at major companies has the very real potential to open a door that leads to their big break. 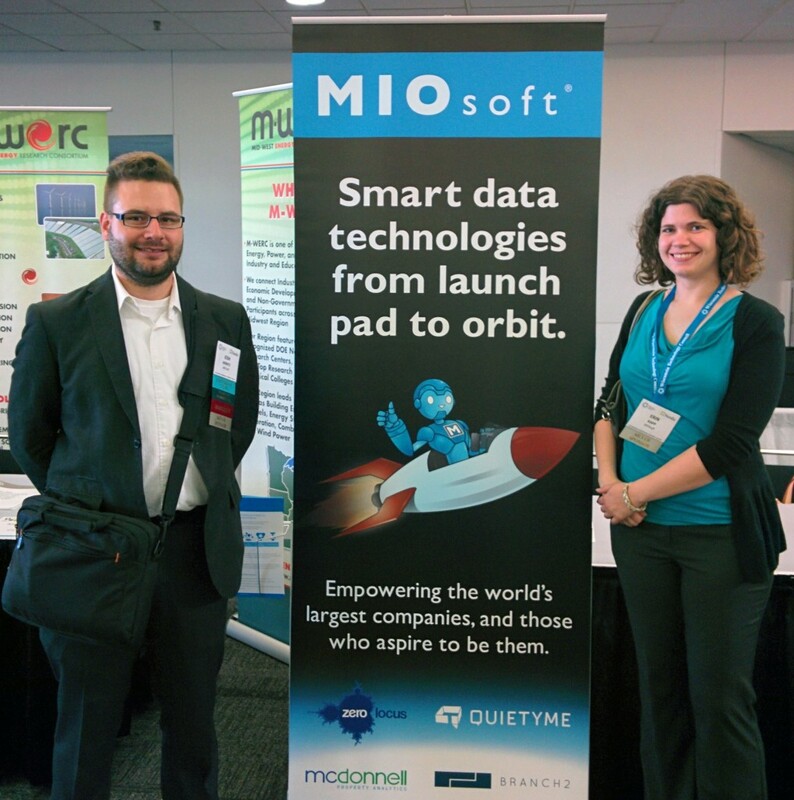 For MIOsoft, it’s a great opportunity to foster relationships with a host of other Wisconsin companies -- whether big or small, old or young, or somewhere in between. 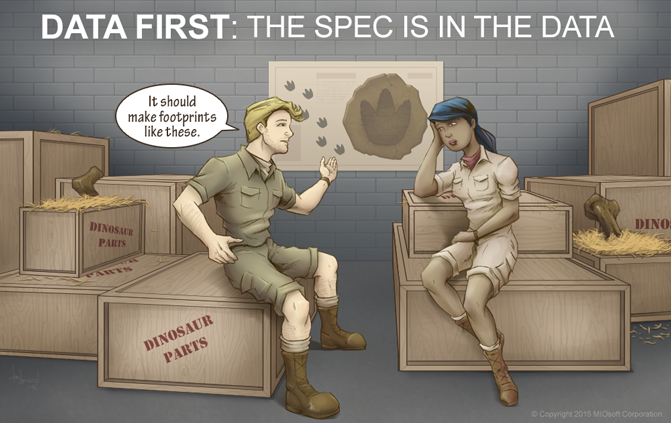 If you’re getting ready to start a new integration, application, or analysis project, you’re probably doing all kinds of requirements gathering. Unfortunately, unless you’re considering data first, the copy books are probably wrong, the state diagrams are probably incomplete, and the business processes are probably too simplistic. These problems are extremely prevalent in data-centric projects. Traditionally, you use a data last method—you build up the specification a priori, and only use the full, real data set when you try to put your project in production. MIOsoft received the highest product score of all vendors rated in the Data Migration (4.47 out of 5), Information Governance Initiatives (4.38 out of 5), and Big Data (4.46 out of 5) use cases in Gartner's Critical Capabilities for Data Quality Tools report,* which included 6 use cases total. Big data has a big problem. 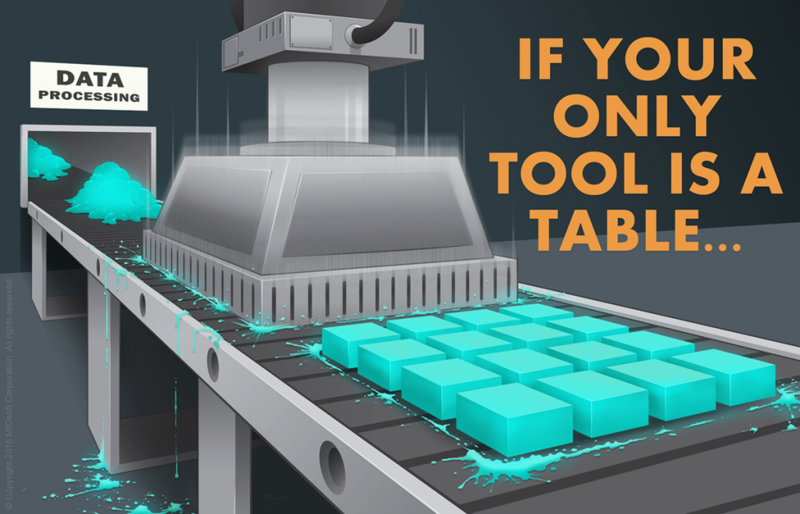 You know that data lake you recently started filling? 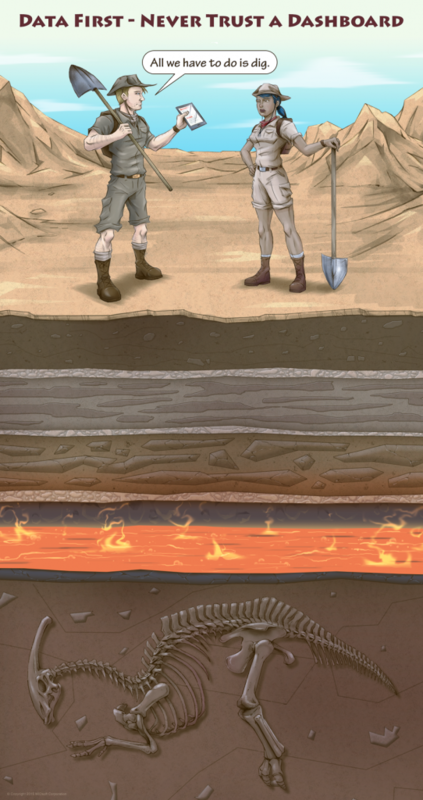 Its data ecosystem is already well on its way to a catastrophic tipping point. 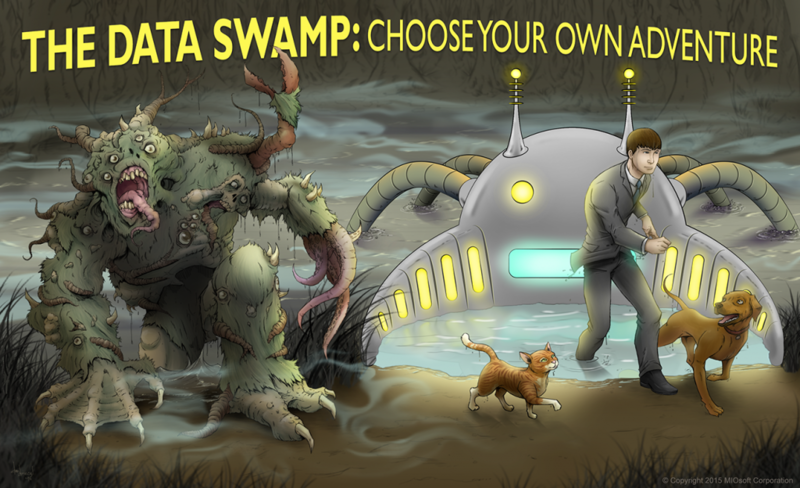 Has a platform vendor convinced you to dive in with visions of a serene data-lake-side cabin in the woods? 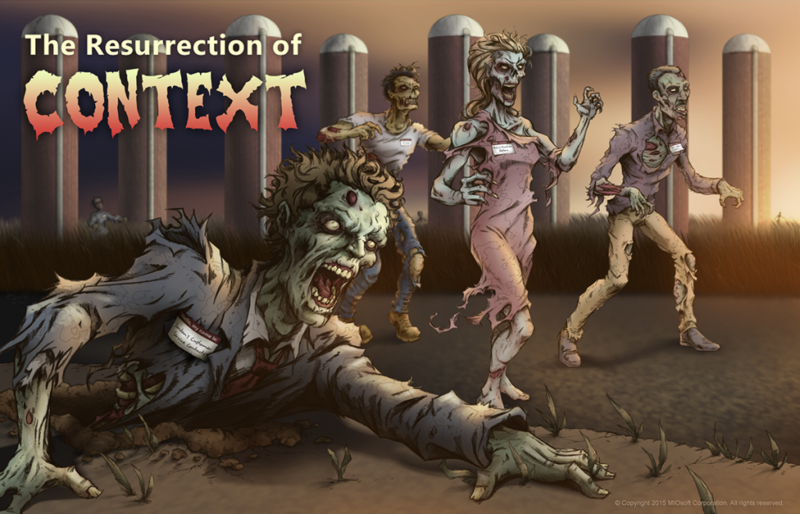 They probably forgot to mention how many horror stories have the same setting. Don’t hold a grudge. Vendors were just responding to the market created by a steady stream of people eager to claim the title of Big Data Thought Leader. Tell me if this sounds familiar: You took a class in high school or college because you had to. Or because your first choice class was already full. Or because your crush was taking it. But then that class changed your life. Maybe in a small way, where you’re interested in that subject as a hobby now, and maybe in a big way, where that subject is your career now. 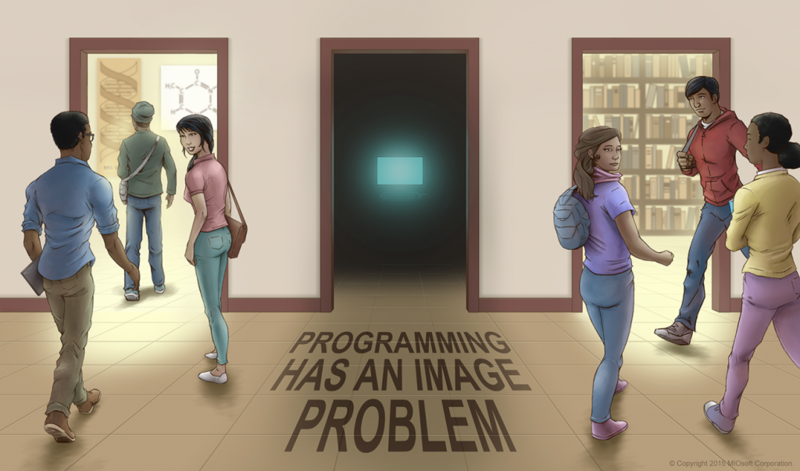 A typical introduction-to-programming class doesn’t really lend itself to this kind of transformative experience. Not that it’s never happened; I’m sure it has. But even the very first introductory course, the elective one for non-majors, tends to start you out with a blank screen and a blinking cursor. Summary tools like dashboards are great. 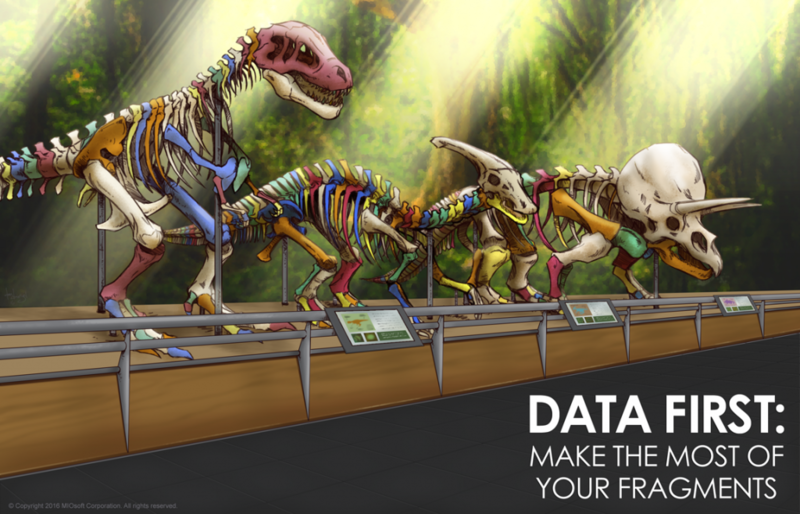 They make it easy for us to consume and extract meaning from large amounts of data. Here at MIOsoft we’re very excited about how our technology can contextualize input from Internet of Things devices at large scales. 100 door alarms on your campus? 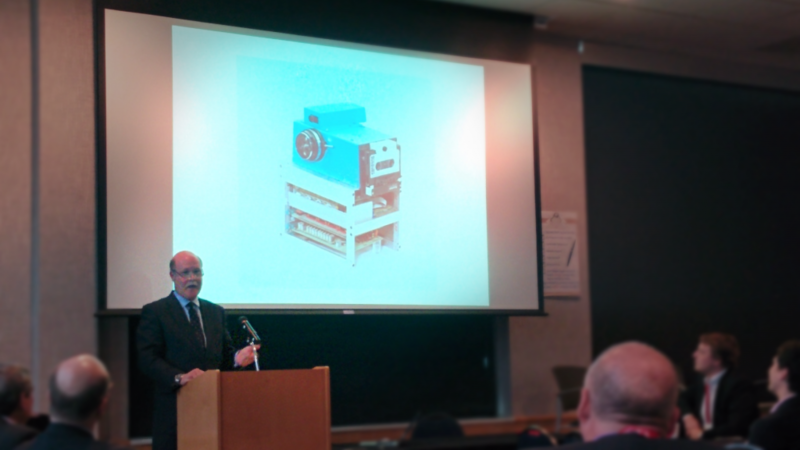 5,000 air quality sensors in your hospital? 100,000 sensors in your fleet of trucks? No problem. But we don’t spend all our time at work, so we’re also excited about some of the new consumer-targeted IoT. Here are 4 of the personal IoT devices that caught our attention last year. 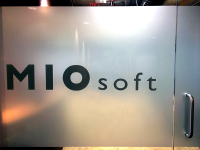 Disclaimer: Opinions given by MIOsoft employees are their own, not the official opinions of MIOsoft Corporation. MIOsoft does not endorse any of these products or services. If you were to ask me in conversation what MIOsoft does, I’m sure I would include the term “big data” by accident. I’ve avoided the term “big data” in my own lexicon recently because of its overuse in marketing and media, but there’s actually an impressive degree of accuracy in describing MIOsoft as a big data company. 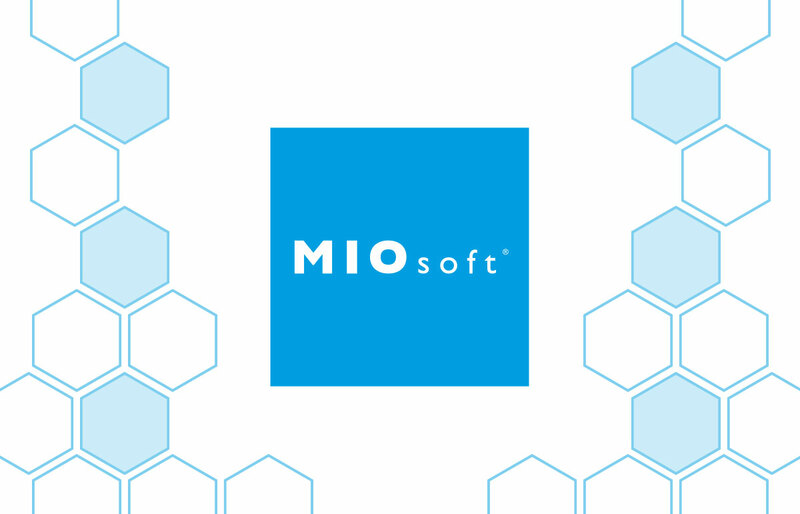 In 1998, MIOsoft’s goal was to create the technology necessary to efficiently combine all data available and discover the relationships within the data. We needed to process thousands of sources, each with constantly changing data, and we knew it would require some particularly well-crafted technology.